With the exception of my last post on our Funky Chickens, it has been a while since I posted on The Art Garden. I have still been occasionally active on my Instagram page, but other than that I have been hitting the floor running with my new gig…I’m back to teaching art! I have been a stay at home mom for 6 years so it has been a minute since I have been teaching in a school art room. I have loved every minute of my days at home but it has been fun getting back into my old routine. I won’t lie, though…I did shed some tears on my first day away from the girls! I was initially nervous and worried that I wouldn’t remember how to teach but it was like riding a bike and I picked up right where I left off. 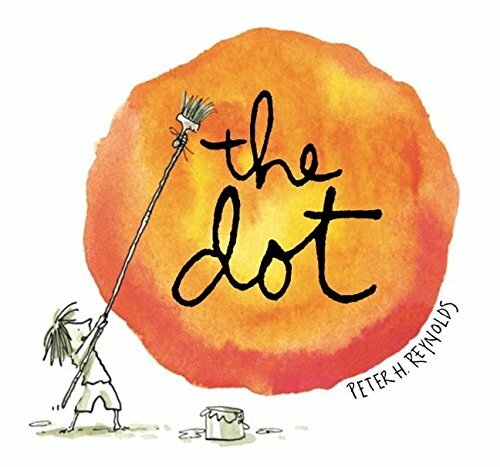 I started my first days of school reading one of my favorite art books for children, The Dot by Peter H. Reynolds, and we began working on a variety of Dot themed art to celebrate International Dot Day. I split up the Dot projects among my different K-2 classes. See below for the variety of media and processes we explored. A few classes of my little Kinders made some Dot Paper Plates. This was a simple and fun process for this age group and the Do-A-Dot markers are an easy clean up option for paint. I just love the way these turned out! So pretty! Some of my other Kinders printed with circle objects. Little ones love this process because it is basically like stamps. What kid doesn’t love stamps?! I collected various circle shaped objects such as bottle caps and lids, toilet paper rolls, bubble wrap, and small cups. They dipped them in a plate of paint and stamped on a 12×12 sheet of art paper. A few of my first grade classes got busy with little dots using cotton swabs. We discussed the artist, Seurat, and pointillism and then they created their own painting consisting of only dots. Some of my other first graders experimented with coffee filter diffusion. They loved this process! We just dabbed some liquid watercolor onto large filters. They turned out beautiful! A few other first grade classes also learned about the artist Kandinsky and created paper circles inspired by his art. We traced circle shapes with plastic tops onto construction paper, cut them out, and layered them from large to small. My second graders also learned about Kandinsky and did a different version of circle art inspired by the artist. They used oil pastels to create concentric circles on a small square of black paper. I combined all of them together and hung them in the hallway. As a bonus Dot activity, my K-2 students all worked together to create this large circle painting on butcher paper. I covered a round table in the art room with butcher paper and taped it down. Each class took turns “Making Their Mark” with tempera paint. I showed them how to go around or add to existing painted image, rather than paint on top and cover someone else’s work. They worked so hard and did a great job! I painted over the final painting with a gloss medium to protect it and keep the tempera from flaking off. Be sure to pin these ideas for International Dot Day next year!